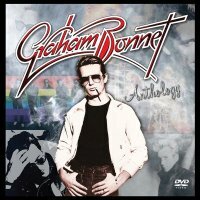 Cherry Red Records has surpassed itself with a stunning collection of songs from the long career of UK vocalist extraordinaire Graham Bonnet. Entitled 'Anthology 1968 – 2017', this box-set includes two CDs and a DVD. The DVD is very much the enticement for Bonnet fans who most likely already own the Alcatrazz, Rainbow and Michael Schenker Group albums. Some of the clips are introduced by Bonnet himself in his quirky self-effacing way, and cover key points in his career. This starts with the seventies R&B/Pop era, when he was big in Australia & New Zealand, with amongst others 'It's All Over Now Baby Blue' and the Bee Gees-penned 'Warm Ride'. Next up, are the 'Line Up' promos, and it's nice to see Cozy Powell and Jon Lord there, along with Micky Moody. Following this are the very eighties Alcatrazz videos, whereas the Impelletteri association is reflected with the 'Stand In Line' video, plus considerable concert footage of the band in the late eighties. Snuck in the middle of all this and more or less bringing things up to date, is a dynamic video of the recent 'The Mirror Lies' played by the Graham Bonnet Band. As for the audio discs, it's a comprehensive collection of Bonnet's solo hits and a good selection of songs from his time in the Metal bands – Alcatrazz, Anthem, Blackthorne and Impelletteri. Interestingly, the much-maligned (at the time) Blackthorne songs actually sound pretty good to me in 2017. To confirm the album covers all bases, there are also tracks from Bonnet's time with the Taz Taylor Band and the Forcefield project. Bonnet's involvement with Forcefield resulted in a couple of studio albums intended for the Japanese market, and included performances from Powell, Ray Fenwick and Jan Akkerman. The less well known Bonnet solo albums, 'Underground' and 'The Day I Went Mad', are partly represented by 'Breakaway' and 'Killer', which interestingly are not the most memorable songs from those albums. However, also from 'Underground', there is a bombastic re-recording of 'Lost In Hollywood'. There are some previously unreleased songs and some demos which are interesting and vital for the Bonnet completist. His tenures with Rainbow and MSG are covered by the inclusion of the B-sides 'Bad Girl' and 'Girl From Uptown' – as many know, both are excellent songs and just as worthy as their respective album tracks. The package brings us to the present time with the Russ Ballard-penned 'My Kingdom Come' and the aforementioned '...Lies'. In all, thirty-six tracks and twenty-three video clips are included, making this package (with nice liner notes from Bonnet himself) a worthy tribute to one of the greats.